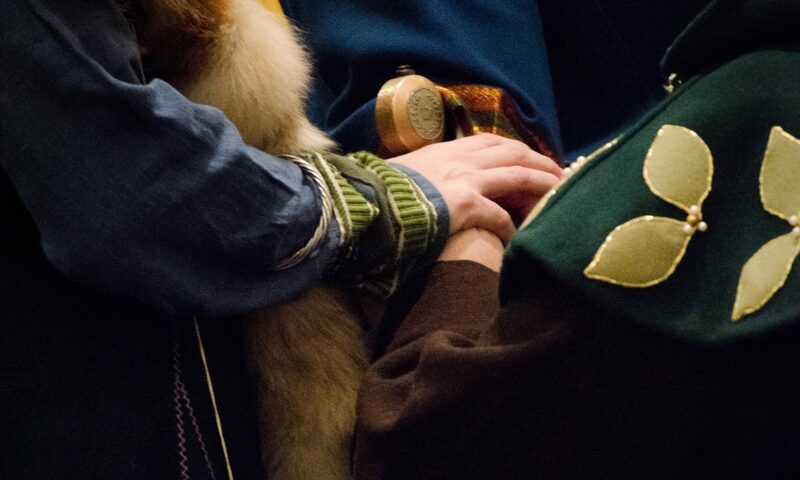 Since it’s that time when people start having Pennsic Panic, and think “I need a heraldic surcote, or jupon, or apron dress, or something fancy…” I wrote up a short, somewhat disorganized tutorial on how to applique things onto other things. Suffice to say that I’m not gifted with a needle (well, not one attached to a sewing machine at least) so trust me that if I can accomplish something with this, anyone can. Decide what you want to do – a dress, a banner, a tabard, and if it’s a garment, complete the garment or at least the part of the garment you’re going to applique on. Don’t do the lining part yet, but you may baste it on to give light fabrics extra support. If you’re doing a banner, you will want to baste the lining on in advance, or your item will go all wonkedy-whumpus and sag in weird places. Get iron-on stuff (the kind with two backings) at the craft store – like Heat n Bond; get it in the roll if you can – for big appliques. It’s usually with sewing notions and quilting stuff I think at the craft/sewing store. I like the heavier-weight stuff, it worked better for me. Lay out your to-scale drawing. Lay out your bond paper over itand trace the design with sharpie markers, using the bond paper as tracing paper. You can also trace with a light projector, or do it freehand if you’re gifted at that kind of thing. Rough-cut out your traced design in the bond paper, giving yourself a good amount of space to cut it out accurately after – 1/2 inch at least around every line. You can be sloppier if you want to – you’re going to trim on the design line later anyway. Iron your applique fabric so that it’s smooth, as much as you can. Remove the paper from one side of your cutout bond paper. Lay the bond paper cutout on the fabric and pin it if you need to (if it’s really big). Iron the adhesive paper to the applique fabric. Follow the directions on the bond paper package. Cut out the fabric now to your traced/drawn lines. Keep close to your drawn lines, and keep your cutting nice and tidy. This is what the applique will look like, unless you’re doing a lot of embroidery on the edge. For some things that will not be stitched, but only bonded this way, this is the final edge. Prepare the thing you’re appliqueing. You’ll want to be sure it’s ironed. Remove the paper backing from your applique piece. Carefully place the applique on the garment. Now is the time for any final trimming or adjusting. Iron the applique onto your item. There is no step number six. Add stitching or embellishing (paint, spangles, beads, etc) to your piece. Stitch around it in the way you like best – hand, by machine, etc. Some people leave it without stitching, and you can, but stitching is often beautiful and helps secure it. Finish sewing the item / garment / complete sewing the lining or backing / etc. Go out and look awesome. You can also iron smaller pieces onto the main piece, if you wish. Realize that the addition of the bond does add another layer, so you’ll want a really beefy needle for hand-embroidery or embellishing. You can use scrap fabric to a point – you just need to be sure you get bits to line up on the bond layer so they will look ok once ironed down. It’s prettier (though wasteful) to use a whole swath of fabric, and there’s something to be said about cutting out smaller pieces. You just have to be ready to assemble them on the item to be embellished. I strongly suggest numbering things like leaves that have similar size but go in some purposeful order. You don’t *have* to use the same fabrics on same fabrics, but it looks nicer, I think. I have been cautioned against using synthetic “felt” on things – try to get wool felt if you can. I understand that the synthetic felt pills, and pulls, and falls apart more quickly, and since you’re putting a lot of work into this anyway, it’s worth it to do it right at that point. You can also go straight to the “cut the fabric” stage, and use a fabric glue, and then stitch it down. I think the paper-backed stuff is more fool-proof, though it’s extra steps and a little more expensive. The gigantic amount of bond does really help it stay on though, and it makes it firm enough that cutting is easier. The bond-sheet also keeps the fraying down on the edges you’ve cut. Here’s a video about using iron-on adhesive.